Franz Hoffman’s first Kickstarter project is already a big success. There is a good reason for that, his project will solve a problem graphic designers have faced for years: the technicalities of creating fonts are hard. 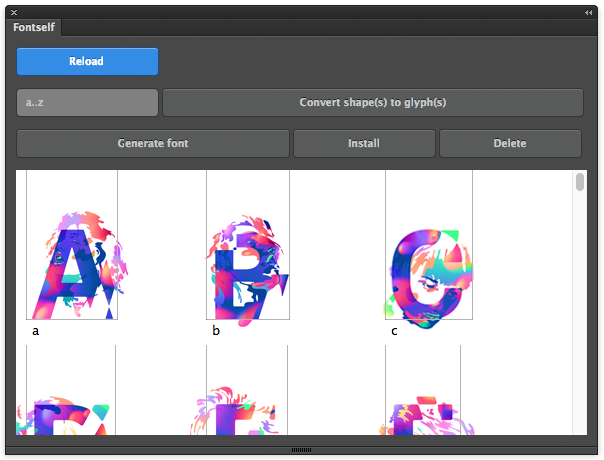 Fontself makes it possible to create fonts directly from Adobe Photoshop or Adobe Illustrator. Fontself works as an extension for both of Adobe’s popular softwares. All your shapes drawn in Photoshop or Illustrator can be converted to glyphs in a matter of seconds. It doesn’t make the letter creation process any easier, but it really makes the font creation much more simple. For now, you can make sure you’ll get your copy of Fontself by supporting the project on Kickstarter. You can also follow Fontself on Twitter to keep up-to-date with their latest news.